For years now, I’ve tried to instill the self-discipline for a daily morning yoga and meditation practice. At first, it went really well. I would get out of bed at least 25% of the time, right after my alarm, and hop on my yoga mat. I would stretch, breathe and stay in the more restorative poses for longer than I needed to. And then my practice started to diminish. When the alarm sounded, I would turn it off and bargain with myself for another 10 minutes of rest. Then I would wake up an hour later and find it was too late for any yoga at all. Gradually, my 25% success rate became 10%. And 10% became 0%. I spent a long time being disappointed in myself. I really, really wanted to be one of those people who could eventually say they’d maintained a morning yoga practice for the past 20 years. It seemed like such a good way to start the day, and such a good way to advance in my yoga practice. But after 2+ years of beating myself up about it, it was time to admit: I need sleep. More of it. At least a full 8 hours of it, in fact. After I get 8 hours of sleep, I’m usually ready to get up in the morning. I don’t spend an agonizing hour or more bargaining with myself to get out of bed while falling back asleep a dozen times. I’m not too groggy or sluggish or dying for caffeine. I decided: if more sleep means sacrificing yoga, so be it. So I’m throwing in the towel on my morning yoga practice, at least temporarily. At this point in my life, I think it’s kinder to myself to allow that full, juicy, 8 hours of sleep to pass behind my eyelids than it is to mentally bully myself into another morning of failed yoga practice. For my teen years and most of my twenties thus far, I’ve convinced myself that anywhere between 6.5 and 7 hours of sleep is totally acceptable. Any more than that, I claimed, would make me feel groggy. 8 hours was too much, I said. And maybe, for a good 10-15 years of my life, that was true. I’ve always been adamant about getting close to a full night’s rest. Any of my friends will attest to this. In fact, even friends 4 years my senior used to tease me for scheduling dinners too early so I could go to bed on time. I’m usually the first one ready to leave the bar. And I don’t think I ever pulled an all-nighter to study in high school or college—my brain isn’t too useful at 4 am, anyway. Deprive me of sleep and not only do I become seriously cranky, but I also get sick easily. In fact, when I was 18, I was getting so little sleep that I contracted mono (and the stress on my liver and immune system hung around for YEARS). Let’s be honest: I feel like crap without enough sleep. I’ve been reading a lot about the importance of sleep for everything from hormone problems to autoimmunity. And, as the theme of the year for me has been healing my hand eczema, I’ve started welcoming more sleep with open arms into my daily healing regimen. SLEEP IS CRUCIAL. IT’S LIKE WATER. GET LOTS OF IT. I know hysteria over our culturally approved, chronic sleep deprivation is all over the Internets, but let’s just review for a minute. 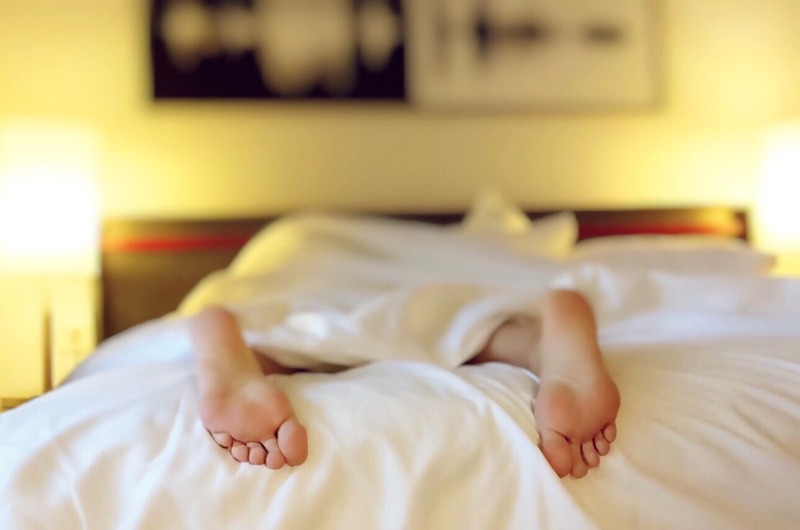 What’s more, another recent study suggests there’s a strong link between sleep disturbances and gastrointestinal disorders. That’s a particularly tricky puzzle to solve. Lack of sleep negatively affects the immune system, which has the potential to develop into things like inflammatory bowel disease and GERD. And because of the gastrointestinal distress, the affected person cannot sleep a full 8 hours. If this doesn’t tell you something about the body’s need for adequate sleep, I’m not sure what does. So if you don’t have gastrointestinal problems, I’m begging you: do what you can to ensure proper sleep. Every. Single. Night. Part of my lack of sleep in my youth came from a serious case of FOMO (fear of missing out). I sacrificed sleep for good times, anticipating I would be able to catch up later. But this post by The Paleo Mom declares that sleep debt doesn’t exactly work the way we think it does. You can’t just catch up on those missed hours over the weekend. It was time to get over my FOMO and pass out. I’m not a chronic insomniac (I do occasionally have problems falling asleep, and I usually wake up once or twice in the middle of the night—but I go back to sleep without much trouble), so getting better quality sleep is not a high priority for me. The same self-discipline I tried to formulate for my morning yoga practice is now applicable to my sleeping habits. It’s just a matter of leaving myself enough time to wind down and go to sleep early enough to get that complete night’s rest. Oh, naps. That’s a whole other story. I used to hate naps because they would throw me off. I would wake up groggier than when I went to sleep, and then I would have issues falling asleep at my normal bedtime of 11:00. The worst was waking up to a dark sky outside. Nothing makes you feel like you’re in a horror movie quite like waking up at night. But now I’m even learning to love naps, too. I’m going all-out with this sleep thing, because after mild sleep deprivation for years on end, I’m finally starting to accept that lots of sleep is necessary, and even enjoyable. I don’t care if people think I’m lazy. I don’t care about what I “should” be doing instead of sleeping. I don’t care about missing out on those final hours at the bar (newsflash: they’re likely very similar to the first few hours at the bar). I am really coming to despise the unspoken cultural badge of honor that is working too much and being “busy”. When did it become impressive for people to work themselves to death? When did we start revering stress and stop valuing self-care? When did getting 5 or fewer hours of sleep per night become an enviable way to live? Cue the listener expressing their sympathy/being impressed, and the worker with dark circles under their eyes feeling adequately pitied. Priorities are where you put them. And that goes for rest and recovery, too. You always have a choice where your work and personal life are concerned. It may not be an easy choice, but unless you have problems falling asleep and staying asleep (or unless you’re a new parent or something), more sleep can be within reach for you, too. It requires reevaluating your priorities and taking a hard look at the way you treat yourself, but it’s possible. Allow yourself time to rest. You’ll be a better human being because of it. I’m fed up with this sleep-deprived lifestyle. I insist on my 8 hours per night.